Doctors Are Prescribing Fewer Opioids But Rates Remain High, CDC Says : Shots - Health News U.S. doctors are prescribing opioid painkillers less often and at lower doses, but at rates that are three times higher than their European counterparts, the CDC says. In a new report, the CDC says U.S. doctors are prescribing fewer opioids than they were in 2010, but that overall rates remain high. However, the number of patients getting opioids is still too high, and doctors are giving their patients prescriptions that last longer, according to the report in the CDC's Morbidity and Mortality Weekly Report. "The bottom line is that too many [people] are still getting too much for too long," says Anne Schuchat, the CDC's acting director. "And that is driving our problem with drug overdoses and drug overdose deaths in the country." "We're in the midst of the worst drug addiction epidemic in United States history, but we are still massively overprescribing," says Andrew Kolodny, an addiction specialist at Brandeis University in Waltham, Mass. For the new report, CDC researchers analyzed opioid prescribing patterns in the U.S. from 2006 to 2015, including county-level prescribing from 2010 through 2015. The annual prescribing rate by doctors dropped 13 percent, from 81 prescriptions per 100 people to 71 prescriptions per 100 people, according to the report. Doctors are also prescribing high doses of opioids less often. High-dose prescribing fell 41 percent, from 11.4 per 100 people to 6.7 per 100 people, the CDC says. 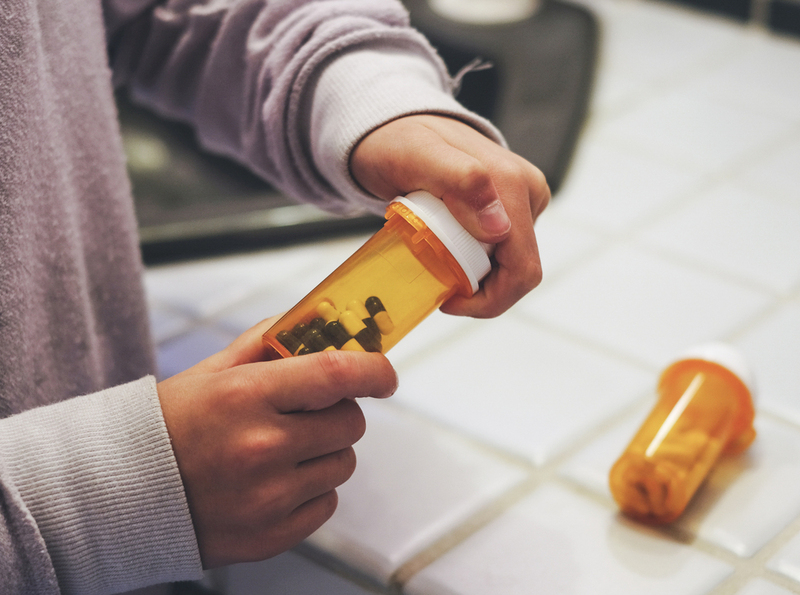 The overall amount of opioids prescribed in the U.S. dropped 18 percent, from a peak of 782 MMEs — morphine milligram equivalents — per capita in 2010 to 640 MMEs per capita in 2015, the researchers found. The length of prescriptions increased from an average of 13 days in 2006 to 18 days in 2015. That's concerning because the longer a person has access to the drugs, the greater their chances of becoming addicted, Schuchat says. Moreover, U.S. doctors are still prescribing three times as many opioids as they were in 1999 and three times more than their European counterparts, according to the CDC. Schuchat says it's enough for "every American [to] be medicated around the clock for three weeks." "That's a lot of opioid use," she says. The latest data show that there are significant variations in how doctors prescribe opioids around the country. The counties where opioids are prescribed the most are scattered around the country, but tend to be places that have high numbers of white, unemployed people with lower levels of education, the CDC found. "There [were] six times more opioids being prescribed in the highest-prescribing counties compared to the lowest-prescribing counties," Schuchat says. "And that amount can lead to a much higher risk for opioid addiction, overdose and death." The latest data precede guidelines the CDC issued in 2016 aimed at reducing unnecessary opioid prescriptions. "It's too soon for us to gauge whether guidelines have had an impact on prescribing nationally, but we've seen 25,000 downloads of our checklist," says Schuchat. Kolodny and Schuchat hope that more doctors will start prescribing opioids much more carefully. They should try harder to use safer drugs, physical therapy and other ways to alleviate their patients' pain whenever possible, they say. "We do see some improvement," Schuchat says. "But we know we have much more to do. We think we are starting to correct the course. But turning a ship of this size will take time." In another development, the drug company Endo Pharmaceuticals announced Thursday that it would comply with a Food and Drug Administration request to stop selling Opana ER — the extended-release version of its opioid painkiller Opana. The FDA asked the company to pull Opana ER after finding evidence that an increasing number of people are crushing, dissolving and injecting the drug, leading to the spread of HIV, hepatitis C and a serious blood disorder.